Season 13 of Supernatural has introduced interesting new characters while reviving some of our favorites. “Good Intentions” continues this fan service with the return of a beloved character, while focusing on the danger posed by the alternative universe Michael (Christian Keyes). Writer Meredith Glynn (“Regarding Dean,” “The Scorpion and the Frog”) and Director P.J. Pesce (“Family Feud“, “There’s Something About Mary“) touch on the gray in the black-and-white world of villains and heroes. 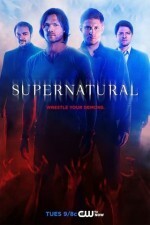 Since the mid-season premiere of Supernatural, there have been some exciting new developments: The Wayward Sisters recused Sam (Jared Padalecki) and Dean (Jensen Ackles) from an alternate universe; Rowena (Ruth Connell) has returned from the dead (again); Asmodeus (Jeffrey Vincent Parise) has sent Arthur Ketch (David Hayden-Jones) to hunt down the devil; Lucifer (Mark Pellegrino) has joined forces with the angel Aniel (Danneel Ackles); and our favorite archangel, Gabriel (Richard Speight, Jr.), has been brought back from who-knows-where. Yet, since the mid-season hiatus, the fate of Mary Winchester (Samantha Smith) and Jack (Alexander Calvert) has been a mystery. As they struggle to escape from Michael and his angel minions, the extent of the archangel’s villainy becomes increasingly apparent. As Chuck Shurley, aka Carver Edlund, told the audience at the Supernatural convention in “The Real Ghostbusters” about angels­—”They’re not nearly as lame as you think.” Angels are soldiers of God, but Michael is a zealot, twisting the word of God to suit his own ambitions. He believes his apocalyptic cause is righteous—which is what makes him so dangerous. Not only is he trying to wipe out the human race in his own universe, but he wants to bring the Apocalypse to Sam and Dean’s universe as well. He tries to use Jack and Mary as a means to gain access. Upon escaping Michael’s prison, Mary and Jack find themselves an ally in the alternative universe Bobby Singer (Jim Beaver), who takes them to a refugee camp. We see Mary’s motherly side both with Jack and with the children at the camp. It was fantastic to see Bobby—not just because Beaver is such an outstanding actor, but because Bobby’s presence is so grounding. He makes any story feel more real. And, is it just us, or does Bobby Singer seem a little smitten with Mary Winchester? Bobby and Mary have a conversation that addresses the guilt she feels about the choice she made to save John. Jack is surprised to learn the angels are responsible for the condition of the refugees. Bobby tells them, “This isn’t a war; it’s an extermination.” When faced with the choice of fleeing to prevent his own capture or coming back to help others, Jack returns to fight the attacking angels. It seems like Jack has gotten his nephilim mojo back. Though we miss Kurt Fuller’s comedic portrayal as Zachariah, actor Chad Rook fittingly plays Michael’s right-hand angel as a brutal and powerful warrior. It’s only when Jack defeats Zachariah that we begin to have hope for the human members of this post-apocalyptic community. So much for Dean’s assertion that nature will triumph over nurture. Jack takes on the role of hero, following in the footsteps of the Winchesters. Of course, the lad hasn’t met his dad yet. An alternative universe storyline that treats the characters living there as more than a backdrop for escape is something to look forward to. Sure, they have Bobby, but it looks like he could use some backup. Does Jack have enough power to defeat Michael? The Prophet Donatello (Keith Szarabajka) is called on to help translate the demon tablet. But as with many others who have responded to the Winchesters’ call for help, it doesn’t end well for him. We’re reminded that the Winchesters have left a trail of bodies in their wake, and not all of them are villains or monsters. Supernatural is at its best when there’s a monster or two into the mix, which we get with the ancient creatures Gog (Michael Johnson) and Magog (Andre Tricoteux). Donatello claims their hearts are needed as ingredients for the spell to open a window into another universe. The loincloth-wearing warriors scoff at Castiel and Dean for having brought no armies to fight them. Gog and Magog provide a fun diversion for viewers, injecting some humor into an otherwise serious episode. And who doesn’t enjoy a Dean- and Castiel-centered mission? After Gog and Magog are defeated, Castiel finds them to be primitive beasts made of rock and sand, lacking the hearts promised by Donatello. The demon tablet infects the soulless Donatello. Once an ally, the now corrupted Donatello lies about the spell and tries to kill Castiel, Sam and Dean. Actor Szarabajka switches from bumbling professor to disturbed menace effortlessly, Castiel tells Sam and Dean, “Theoretically, the human soul would act as a filter, inoculating the prophet against whatever darkness was in the tablet.” If only Castiel had known Donatello was soulless earlier—someone should have filled him in on what he missed while Lucifer possessed his vessel. Castiel’s morality is a line in the sand that has frequently shifted over the course of the Supernatural series. Season 5 of Supernatural saw Castiel emerge from a crisis of conscience to choose freewill over Heaven’s orders. Yet, Castiel has had to be saved from himself on more than one occasion. Castiel has been known to suffer existential angst, which we see again in “Good Intentions.” He has to believe he was brought back for a reason. Castiel decides that his purpose must be to prepare for a war with Michael. Getting into soldier mode has swung Castiel’s moral compass into Season 4 mode, in which the mission matters more than individual lives. Like Jack, Castiel is making his own choice. Though one could argue his decision to force the knowledge of the demon tablet from Donatello’s mind was necessary, it’s hard to claim it’s morally right. “Good Intentions” begins to move us in a new direction, with Jack and Mary joining the fight against Michael. Despite some setbacks, Sam and Dean eventually get the spell they are seeking. Donatello being brain-dead means that Sam and Dean won’t be getting a new prophet to badger anytime soon. Meanwhile, the balance of power may begin to shift in the Apocalypse universe with the help of Jack. “Good Intentions” shifts Season 13 of Supernatural into high gear.